For my last birthday my sweet mother-in-law made me a treat box filled with Hershey's Nuggets that spelled out "Happy Birthday". So when Kayla suggest we pcLayers gals get creative for Valentines and spread some love with digital freebies i knew just what to do! 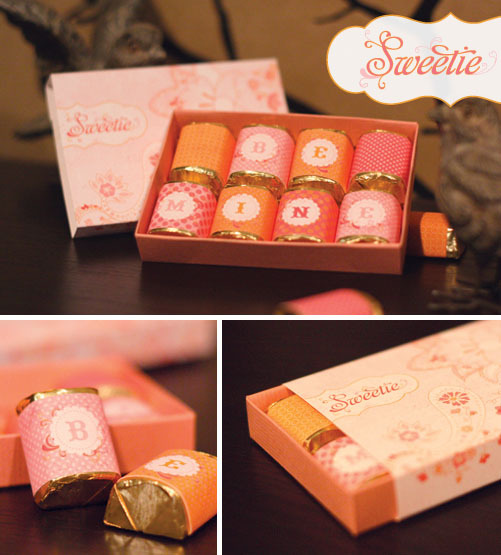 This download includes designs and templates for the top and bottom of the "box", as well as wraps for the chocolate candies. (It's a miracle any "nuggets" were left for the photo, i've been munching on them all day! yum!) This design would also coordinate well with the Two Scoops paper line I created for BasicGrey, I'd especially love to make the box top out of the Creme Brulée pattern! The paper pack comes with some awesome stickers, and you can also buy swirly heart and sentiment acrylic stamps, plus their FIRST line of colored rub-ons! I LOVE how the whole line turned out, it was a lot of fun to create! Here's where you can find more Valentine freebies from the pcLayers team!